Choose your own path through this seemingly endless game in a quest to become the king of the hill! This addictive game will keep you entertained for hours on end with exciting gameplay and 66 unique levels! If that’s not enough - unlock survival mode! Battle chainsawers, gunslingers, medics and more. This exhilarating tale isn’t a walk in the park - each lumberjack presents you with a new threat and a challenge to overcome! - No in app purchases needed to progress in the game. - Stunning graphic and beautiful animations! - The ultimate strategy and action-defense game, wrapped into one wild package! - Challenge your friends via Game Center or Google Play on the endless Survival Mode! - Collect over 40 achievements as you advance through the game! Can you collect them all? "Lumberwhack is perfect for quick sessions, long playthroughs, or anything in-between...it's also one of the most fun castle defense games I've played...ton of bang for your buck..." 4 Stars, TouchArcade. "You will find yourself missing stops on a train trying to fight off the waves of enemies, and not care one bit." 9/10 Stars, Developer's Accomplice. "This is tower-defense gaming evolved: incorporating features of other titles in the genre and refining them into something addictively pure." 8.5/10 Stars, Noobsource. A major update for the action-packed castle defense game Lumberwhack:Defend the Wild is now available for both ‪iOS‬ and ‪Android‬! You can read more about the changes and improvements further below. Lumberwhack is an one-man project. Please show support (like/share) and email any feedback, thanks! The update includes a lot of improvements that I hope will make the game even more enjoyable for everyone. A summary can be seen below. - New automatic collect food system, more focus on fighting. - New Gallery section, view all your animals, skills, enemies and game progress. - New Daily Bonus with rewards! - New In-game Achievements with rewards! - New visual fighting effects. - New Stage Bonus with lucky draw reward after each stage! - New and more detailed tutorial. 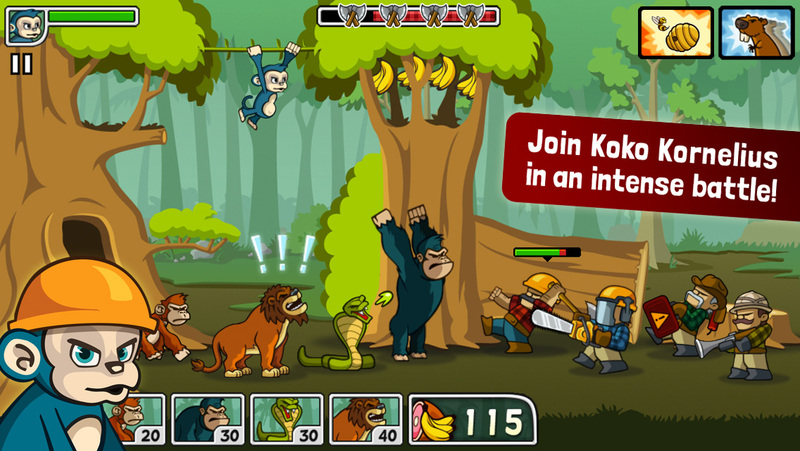 - New Intro movie, staring Koko and the vicious lumberjacks. - New zoom & pan button, get a better overview of the battlefield. - The lumber truck at the end of each stage can now move closer and attack, destroy it to gain victory!. - Old Inventroy Items are now Power Ups or Consumable. - Enemies on Endless Mode now drop Power Ups, Consumable and Leafs. - You can now tap on dropped items to directly pick them up. - Improved all animals Epic Skills to be more useful and powerful. - Unlock Pathfinder to discover the location of rewards on the map. - You can now ask your Facebook friends for free Leafs! - Leafs can now be bought with Acorns. - Replaced Permanent Magnet with Teleport. - General difficulty and level balance. - Max animal and skill level increased. - Changed the location of animals & skills on the map for better team setup and game progress. Read more about Lumberwhack at Koloss Interactive development blog. 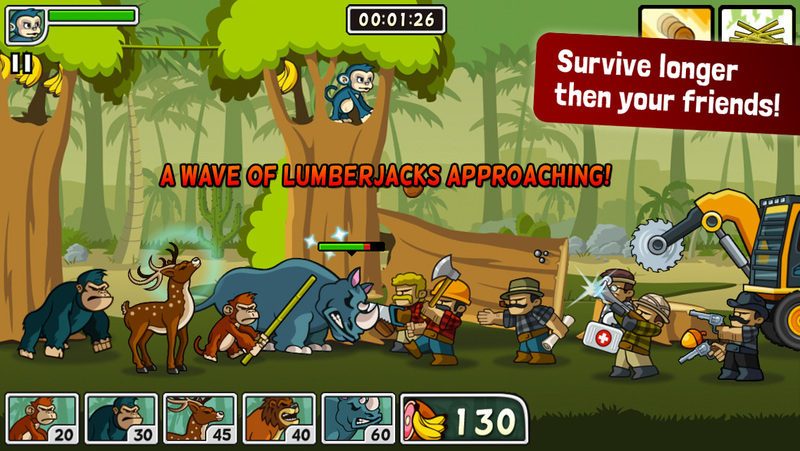 Lumberwhack: Defend the Wild now on App Store! Lumberwhack has been submitted to Apple! End game preview - Bring it on! New screen-shot preview for side-scrolling defense game Lumberwhack. It looks awesome! I will definitely buy it when it comes out!